Nomencl. ref. : Mem. Acad. Imp. Sci. St. P�tersbourg Hist. Acad. 10: 285 (1826). Map for Ceanothus thyrsiflorus Eschsch. 1) Ceanothus americanus L. 2) Ceanothus americanus L. var. intermedius (Pursh) T... 3) Ceanothus americanus L. var. pitcheri Torr. & A. G... 4) Ceanothus intermedius Pursh 5) Ceanothus arboreus Greene 6) Ceanothus arboreus Greene var. glabra Jeps. 7) Ceanothus x arcuatus McMinn (pro sp.) 8) Ceanothus x bakeri Greene ex McMinn (pro sp.) 9) Ceanothus confusus J.T. Howell 10) Ceanothus divergens Parry ssp. confusus (J.T. Howe... 11) Ceanothus connivens Greene 12) Ceanothus cordulatus Kellogg 13) Ceanothus crassifolius Torr. 14) Ceanothus crassifolius Torr. var. planus Abrams 15) Ceanothus cuneatus (Hook.) Nutt. 16) Ceanothus cuneatus (Hook.) Nutt. var. cuneatus 17) Ceanothus cuneatus (Hook.) Nutt. var. dubius J.T. ... 18) Ceanothus cuneatus (Hook.) Nutt. var. submontanus ... 19) Ceanothus ramulosus (Greene) McMinn 20) Ceanothus cuneatus (Hook.) Nutt. var. fascicularis... 21) Ceanothus ramulosus (Greene) McMinn var. fascicula... 22) Ceanothus cuneatus (Hook.) Nutt. var. rigidus (Nut... 23) Ceanothus rigidus Nutt. 24) Ceanothus rigidus Nutt. var. albus J.B. Roof 25) Ceanothus cyaneus Eastw. 26) Ceanothus x delileanus Spach 27) Ceanothus dentatus Torr. & A. Gray 28) Ceanothus dentatus Torr. & A. Gray var. 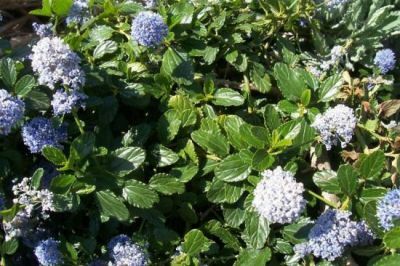 floribundu... 29) Ceanothus divergens Parry 30) Ceanothus diversifolius Kellogg 31) Ceanothus decumbens S. Watson 32) Ceanothus fendleri A. Gray 33) Ceanothus fendleri A. Gray var. venosus Trel. 34) Ceanothus fendleri A. Gray var. viridis M.E. Jones 35) Ceanothus subsericeus Rydb. 36) Ceanothus ferrisiae McMinn 37) Ceanothus x flexilis Greene ex McMinn 38) Ceanothus foliosus Parry 39) Ceanothus foliosus Parry var. foliosus 40) Ceanothus austromontanus Abrams 41) Ceanothus dentatus Torr. & A. Gray var. dickeyi Fo... 42) Ceanothus foliosus Parry var. medius McMinn 43) Ceanothus foliosus Parry var. vineatus McMinn 44) Ceanothus fresnensis Dudley ex Abrams 45) Ceanothus gloriosus J.T. Howell 46) Ceanothus gloriosus J.T. Howell var. exaltatus J.T... 47) Ceanothus gloriosus J.T. Howell var. 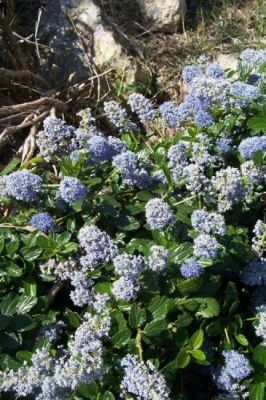 gloriosus 48) Ceanothus prostratus Benth. var. grandiflorus (Tor... 49) Ceanothus rigidus Nutt. var. grandiflorus Torr. 50) Ceanothus gloriosus J.T. Howell var. porrectus J.T... 51) Ceanothus greggii A. Gray 52) Ceanothus greggii A. Gray var. franklinii S.L. 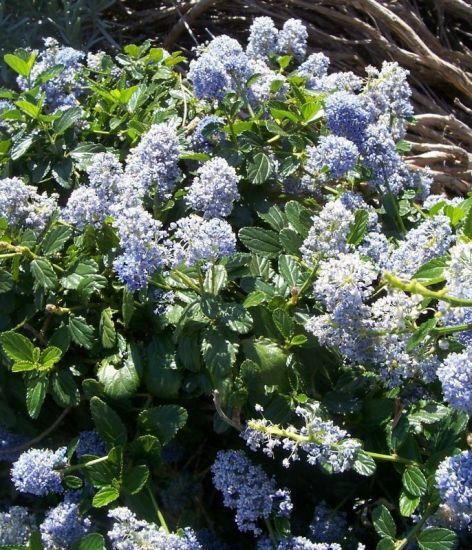 Wel... 53) Ceanothus greggii A. Gray var. greggii 54) Ceanothus greggii A. Gray var. orbiculatus E.H. Ke... 55) Ceanothus greggii A. Gray var. perplexans (Trel.) ... 56) Ceanothus greggii A. Gray ssp. perplexans (Trel.) ... 57) Ceanothus perplexans Trel. 58) Ceanothus greggii A. Gray var. vestitus (Greene) M... 59) Ceanothus greggii A. Gray ssp. vestitus (Greene) T... 60) Ceanothus vestitus Greene 61) Ceanothus griseus (Trel.) McMinn 62) Ceanothus griseus (Trel.) McMinn var. horizontalis... 63) Ceanothus hearstiorum Hoover & J.B. Roof 64) Ceanothus herbaceus Raf. 65) Ceanothus herbaceus Raf. var. 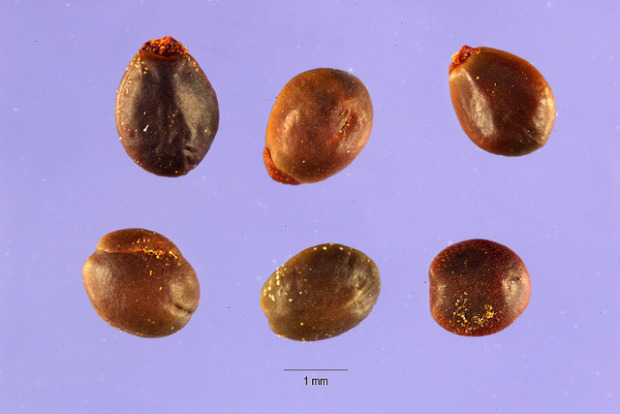 pubescens (Torr. & A... 66) Ceanothus ovatus auct. non Desf. 67) Ceanothus ovatus Desf. var. pubescens Torr. & A. G... 68) Ceanothus pubescens (Torr. & A. Gray ex S. Watson)... 69) Ceanothus impressus Trel. 70) Ceanothus impressus Trel. var. 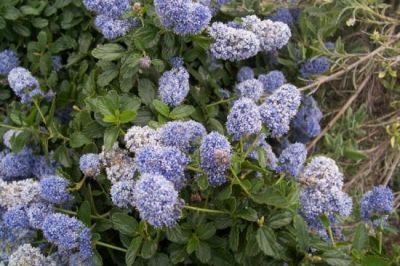 impressus 71) Ceanothus impressus Trel. var. nipomensis McMinn 72) Ceanothus incanus Torr. & A. Gray 73) Ceanothus integerrimus Hook. & Arn. 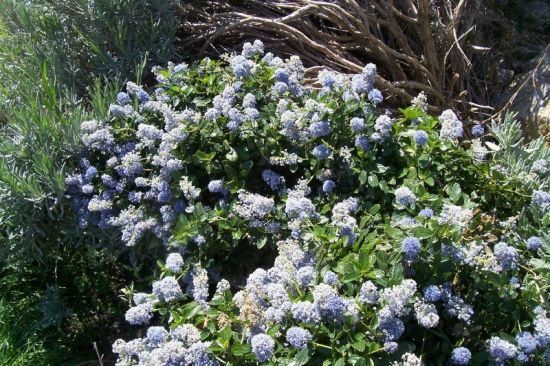 74) Ceanothus andersonii Parry 75) Ceanothus californicus Kellogg 76) Ceanothus integerrimus Hook. & Arn. var. californi... 77) Ceanothus integerrimus Hook. & Arn. var. macrothyr... 78) Ceanothus integerrimus Hook. & Arn. var. puberulus... 79) Ceanothus jepsonii Greene 80) Ceanothus jepsonii Greene var. albiflorus J.T. How... 81) Ceanothus jepsonii Greene var. jepsonii 82) Ceanothus lemmonii Parry 83) Ceanothus leucodermis Greene 84) Ceanothus x lobbianus Hook. (pro sp.) 85) Ceanothus x lorenzenii (Jeps.) McMinn 86) Ceanothus velutinus Douglas ex Hook. var. lorenzen... 87) Ceanothus maritimus Hoover 88) Ceanothus martinii M.E. Jones 89) Ceanothus masonii McMinn 90) Ceanothus megacarpus Nutt. 91) Ceanothus megacarpus Nutt. var. insularis (Eastw.)... 92) Ceanothus insularis Eastw. 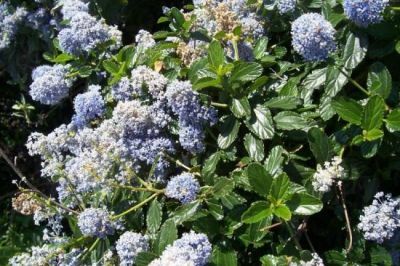 93) Ceanothus megacarpus Nutt. ssp. insularis (Eastw.)... 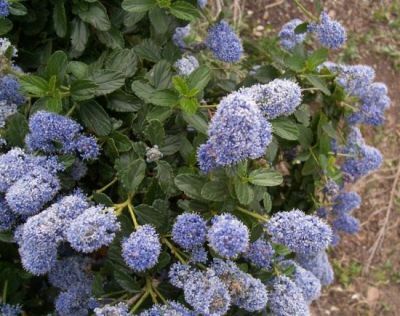 94) Ceanothus megacarpus Nutt. var. megacarpus 95) Ceanothus megacarpus Nutt. var. pendulus McMinn 96) Ceanothus x mendocinensis McMinn 97) Ceanothus microphyllus Michx. 98) Ceanothus oliganthus Nutt. 99) Ceanothus divaricatus Nutt. 100) Ceanothus hirsutus Nutt. 101) Ceanothus oliganthus Nutt. var. oliganthus 102) Ceanothus oliganthus Nutt. var. orcuttii (Parry) J... 103) Ceanothus orcuttii Parry 104) Ceanothus ophiochilus Boyd, Ross & Arnseth 105) Ceanothus x otayensis McMinn 106) Ceanothus x pallidus Lindl. 107) Ceanothus palmeri Trel. 108) Ceanothus spinosus Nutt. var. palmeri (Trel.) Jeps... 109) Ceanothus papillosus Torr. & A. Gray 110) Ceanothus papillosus Torr. & A. Gray var. papillos... 111) Ceanothus papillosus Torr. & A. Gray ssp. regius J... 112) Ceanothus x regius (Jeps.) McMinn 113) Ceanothus papillosus Torr. & A. Gray var. roweanus... 114) Ceanothus parryi Trel. 115) Ceanothus parvifolius (S. Watson) Trel. 116) Ceanothus pinetorum Coville 117) Ceanothus prostratus Benth. 118) Ceanothus divergens Parry ssp. occidentalis (McMin... 119) Ceanothus prostratus Benth. var. laxus Jeps. 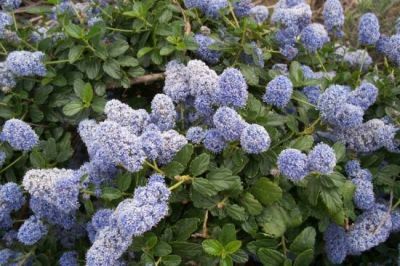 120) Ceanothus prostratus Benth. var. occidentalis McMi... 121) Ceanothus pumilus Greene 122) Ceanothus x humboldtensis J.B. Roof 123) Ceanothus purpureus Jeps. 124) Ceanothus jepsonii Greene var. purpureus (Jeps.) J... 125) Ceanothus roderickii Knight 126) Ceanothus x rugosus Greene (pro sp.) 127) Ceanothus sanguineus Pursh 128) Ceanothus oreganus Nutt. 129) Ceanothus serpyllifolius Nutt. 130) Ceanothus x serrulatus McMinn (pro sp.) 131) Ceanothus sonomensis J.T. 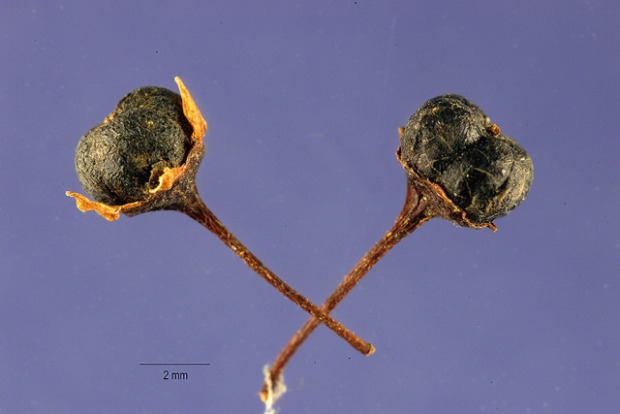 Howell 132) Ceanothus sorediatus Hook. & Arn. 133) Ceanothus intricatus Parry 134) Ceanothus oliganthus Nutt. ssp. sorediatus (Hook. 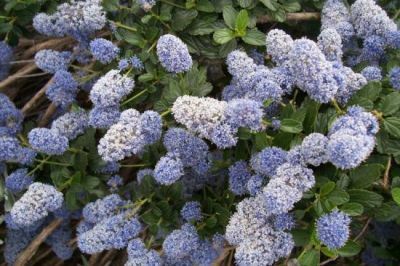 ... 135) Ceanothus oliganthus Nutt. var. sorediatus (Hook. ... 136) Ceanothus spinosus Nutt. 137) Ceanothus thyrsiflorus Eschsch. 138) Ceanothus thyrsiflorus Eschsch. var. repens McMinn 139) Ceanothus tomentosus Parry 140) Ceanothus tomentosus Parry ssp. olivaceus (Jeps.) ... 141) Ceanothus tomentosus Parry var. olivaceus Jeps. 142) Ceanothus x vanrensselaeri J.B. Roof 143) Ceanothus x veitchianus Hook. (pro sp.) 144) Ceanothus velutinus Douglas ex Hook. 145) Ceanothus velutinus Douglas ex Hook. var. hookeri ... 146) Ceanothus velutinus Douglas ex Hook. var. laevigat... 147) Ceanothus velutinus Douglas ex Hook. var. velutinu... 148) Ceanothus verrucosus Nutt.